Eurocom launches VR on the Go solution with EUROCOM Sky X9E and DLX7 now available with Everki Atlas and Titan laptop bags. Eurocom is now launching Everki laptop bag options to improve the ability to travel with high performance, fully upgradeable Eurocom laptops. The EUROCOM Sky X9E and DLX7 are Virtual-reality ready, the high performance hardware within blows away the minimum specs needed to run the incredibly immersive experience and 360 degrees games and videos with an Oculus Rift of HTC Vive. 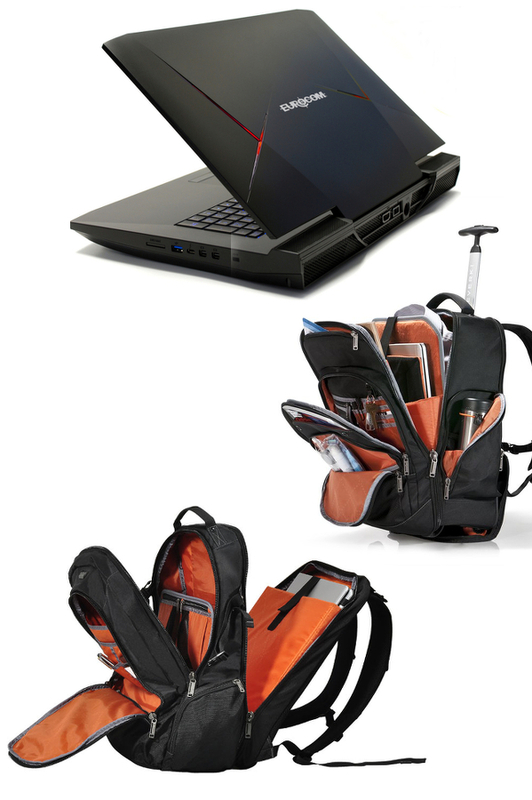 The DLX7 and Sky X9E are heavy duty, high performance, laptops that require heavy duty carrying bags. Professionals who are purchasing these systems require capable carrying bags to make presentations to clients, meeting customers or presenting VR Tech. at conferences like GTC 2016. The HTC Vive is much more than a simple headset, the entire solution is comprised of the Vive Headset, two wireless controllers, two base stations, link box and earbuds. Combine that kit with a EUROCOM Sky X9E or DLX7 and a VR developer is carrying around quite a bit of technology. Pick the bag of your choice while conveniently configuring your custom built Eurocom laptop. We then ship the system to the location of your choice. Freedom and convenience. Choose the system you want, configure to your liking and then have it sent to your door with the quality carrying capability from Everki. “A EUROCOM Sky X9E or DLX7 a VR Kit and an Everki laptop bag is the perfect VR on the Go solution. As the market is moving and expanding into new computing areas such as Virtual Reality, developers and heavy duty users are lugging around more equipment. They need larger capacity backpack to carry their high performance Eurocom laptop and any other accompanying hardware.” Mark Bialic, Eurocom President. Eurocom recently launched the VR Developer Program to assist those who are on the forefront of Virtual Reality development attain the high performance mobile hardware they need. Eurocom’s powerful Sky X9E and DLX7 laptops are state-or-the-art systems that go hand in hand with the latest VR headsets. If you need a new laptop to power the Rift or Vive, Eurocom is the best way to ensure you have everything you need. To qualify for the Eurocom VR Developer Program please send a one paragraph article outlining your work as a VR developer to along with links to your work, website or portfolio. Those chosen will be eligible for a 10% discount on the EUROCOM Sky X9E and DLX7. Eurocom laptops may be a bit on the heavy side, with all the performance and capability packed within. That is why we are now offering Everki Laptop Bags so our customers can easily travel around the world with the capability a Eurocom laptop offers. Customers can now come to Eurocom for a one stop shop of an epic laptop or mobile workstation and the carrying ability of an Everki laptop backpack. The EUROCOM Sky DLX7 takes advantage of an Intel Z170 chipset and socket LGA 1151 allowing it to support desktop Intel Skylake processors up to Intel Core i7-6700K and an MXM slot allowing the EUROCOM Sky DLX7 to support NVIDIA GeForce GTX 980 desktop graphics as well as four SODIMM for support of up to 64 GB of DDR4 memory, 4k 17.3” display and 5TB of storage. The EUROCOM Sky X9E supports the latest unlocked 6th generation Intel Core i7 processors up to 6700K due to the desktop Z170 chipset and LGA 1151 CPU socket. Four SODIMM are supported for up to 64 GB DDR4 2400 and 2133 memory to pair with a high performance, unlocked desktop i7 processor. Four SODIMM are supported for up to 64 GB DDR4 2400 and 2133 memory to pair with a high performance, unlocked desktop i7 processor. As a mobile professional, you require versatility. So we crafted the Atlas Wheeled Backpack with flexible functionality. You can quickly wheel its sleek profile through the airport, or if needed, comfortably carry the Atlas as a backpack with our well-padded and extra wide straps. The Atlas – Everki’s Wheeled Backpack for the mobile professional. Offering you the functionality and intuitive design you’ve come to expect from an Everki backpack, with the traveling ease of a wheeled trolley. Now your mobile office will be completely organized, accessible and easy to maneuver. The Titan. This is where function meets form. We’ve designed this backpack to be large enough to hold what you need, yet intuitive enough to find things where you expect them. Countless hours were spent designing, redesigning and testing the Titan to ensure the quality, versatility and style you’ve come to expect from an Everki bag.